Harmondsworth : Puffin Books, 1977. The Francis books are tender and sweetly drawn. They were all my daughter's favorites. Francis is not such a goody two-shoes that children can't identify. She struggles with the same issues they do. In this book it is the addition of a sibling. Another cute Frances book; this time I'm struck by the patience and sweetness of her parents. They don't act surprised by Frances' actions, they don't overdramatize, they just quietly remind her and each other how vital Frances is to their family. This one was a big hit with both the little boy and the medium-sized girl who are here today. Running away under the dining room table is the single most enchanting thing they have ever heard of. I suspect they will be trying it for themselves shortly. One can't go wrong with Frances. 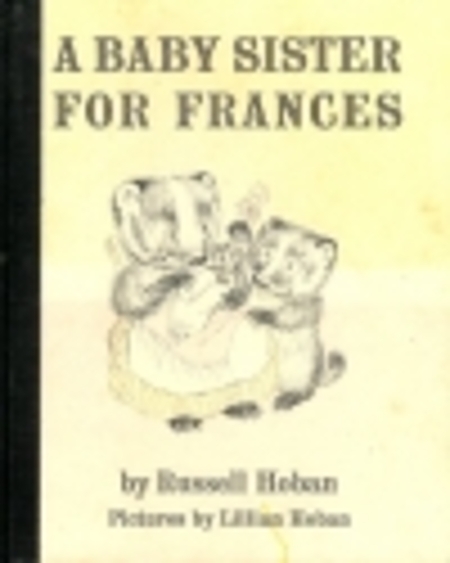 In this book, Frances has to learn how to live with having a baby sister. She runs away to her living room, and after hearing how much her parents miss her, she comes home. She realizes that her baby sister needs her and that she needs to be a good big sister. This book is good one for families who are expecting a new baby. It teaches the older child that their parents can love the new baby and still love and have time for them as well.